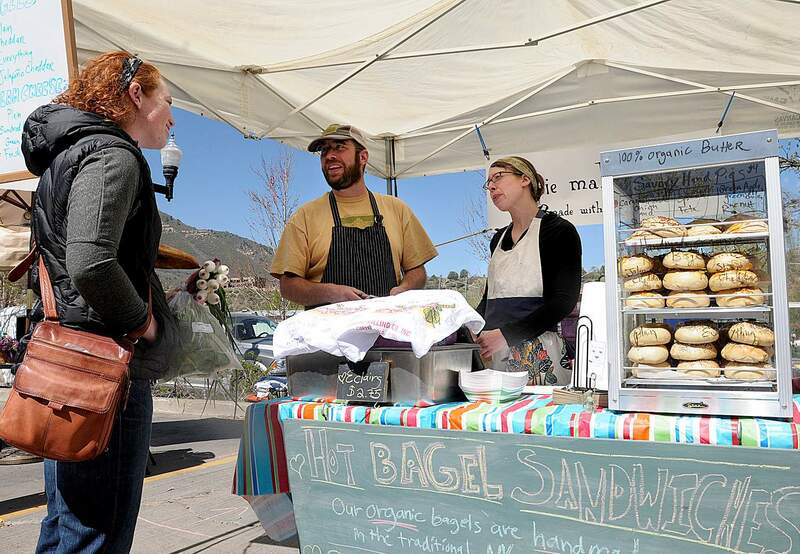 Sophie Montiel, left, talks to Tim Stubbs and Shani Winer, owner of The Pie Maker, a new organic bakery at the Durango Farmers Market. 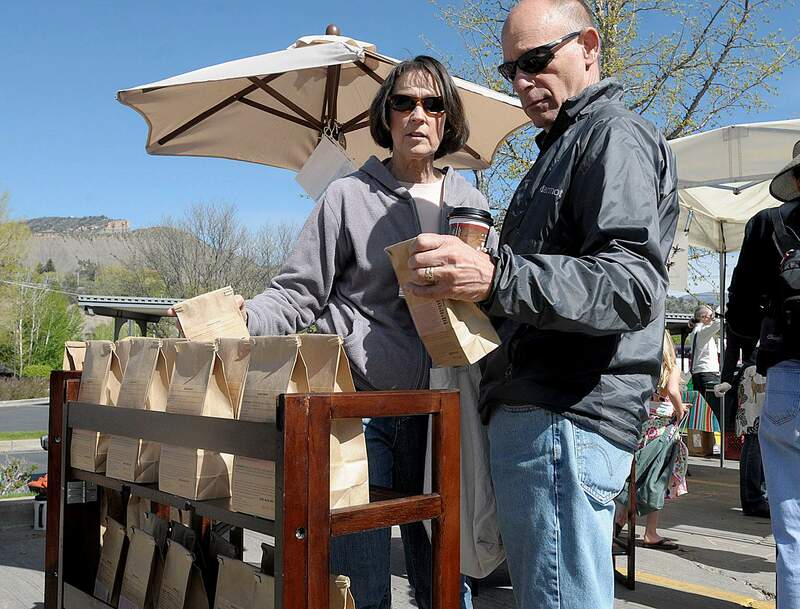 Jim and Janet Coloff take a look at the gluten-free yellow cake mix for sale at new vendor Kokopelli Baking Co. at the Durango Farmers Market. Owner Amber Davis uses sweet sorghum flour in her mixes. 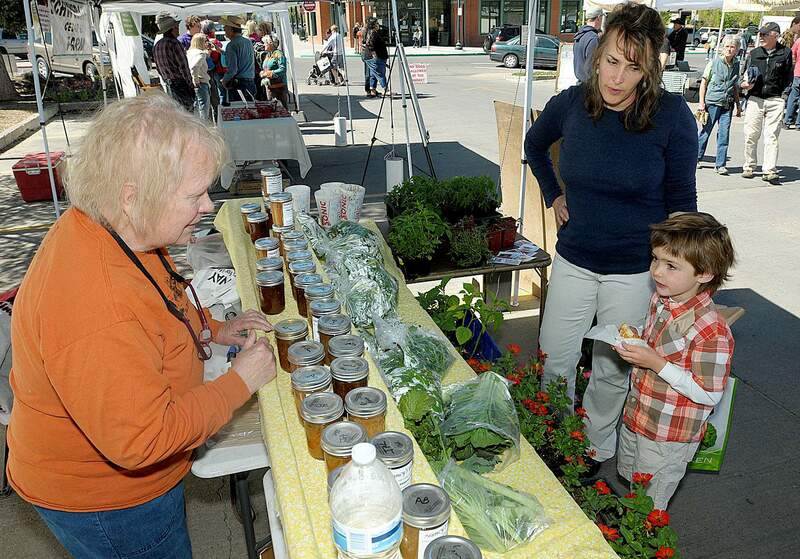 Nancy Nard of Nancy’s Garden, left, talks with Danna Manganaro and her son, Cooper Manganaro, 5, on the opening day of the Durango Farmers Market. Nard grows vegetables near Cortez and doubled the size of her plantings this year. 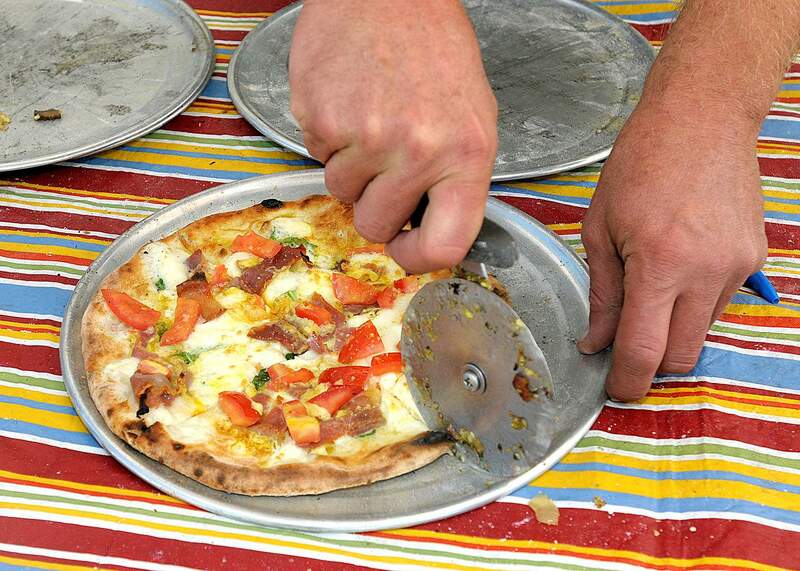 A prosciutto and tomato breakfast pizza is served fresh and hot from Fired Up Pizzeria’s wood-fired cart at the Durango Farmers Market on Saturday. 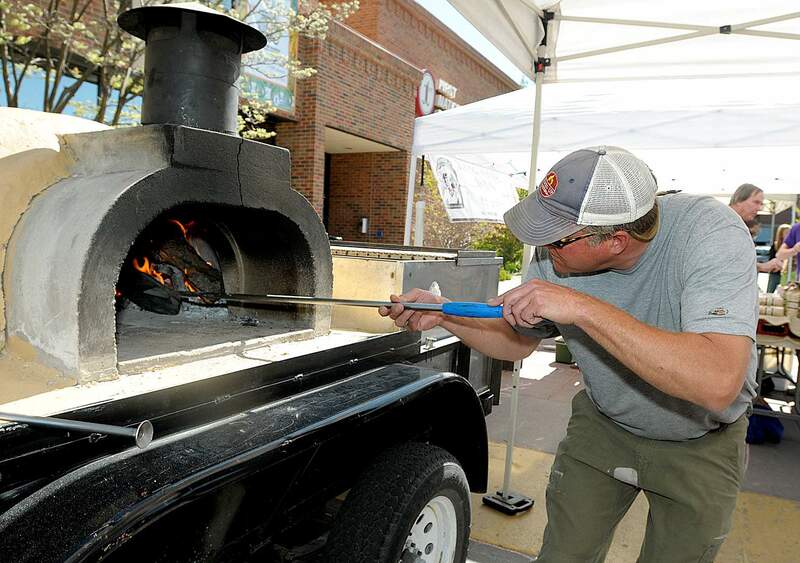 Tad Brown of Fired Up Pizzeria steps in on his day off to stoke the fire at his pizza cart for Durango Farmers Market crowds Saturday morning. 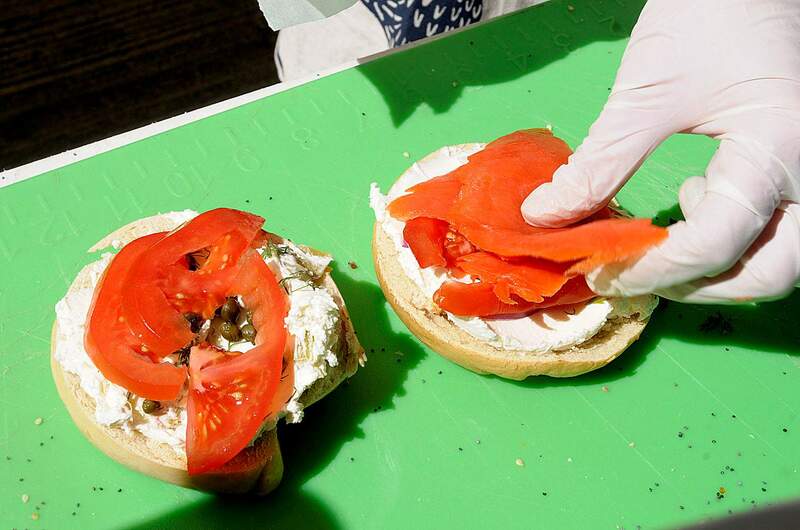 A worker prepares a hot organic bagel sandwich with capers, dill, vine-ripened Colorado tomatoes and wild-caught salmon from The Pie Maker on Saturday at the Durango Farmers Market. As if the opening of the Durango Farmers Market on Saturday wasn’t proof enough of that – or at least, no local farms, no fabulous food – Nancy Nard reinforced the message by hanging T-shirts emblazoned with the motto in her stall. There you could find lettuce, spinach, arugula, chard, mustard greens and parsley – typical produce for mid-spring in our neck of the woods – and a few potted peppers and tomatoes. The spinach and arugula were gone by 9 a.m. Yet it was the lingering cold, not the Southwest’s continuing drought, that was the primary problem for local farmers this growing season. It may have seemed like a marvelously mild winter and warm spring to us, but the below-freezing nights challenged many a Four Corners farm. Michael Schwebach, who owns Cedar Hill Farm near Farmington, showed up with two small baskets on his table, one for oregano and another for basil. As president of the Farmers Market board, he was glad to be there, of course, but he couldn’t keep himself from kvetching, just a little, about the season’s enduring cold nights. So if you were anticipating oodles of early produce – snap peas in May, green beans in June, tomatoes in July – like two years ago during that wonderful warm spring, you’ll be disappointed. Adobe House Farm, one of the few Durango-based farms at the market, sported sweet spring onions, glossy spinach and Swiss chard this May morning. Owner Linley Dixon echoed Schwebach’s complaints about cold night temperatures and the damage that does to tender plants. But what about the 60-degree days in March, the 70s in late April? In fact, in these parts, it’s not unusual for it to freeze as late as June. But Dixon faced another threat recently – varmints, namely gophers. They relieved her of a third of her early tomato crop. That’s not unusual, either – farmers often have to fight off animals eager for an easy meal. Field crops are an inviting target for gophers, squirrels, deer and the like. But Judy Rohwer found out the hard way you have to keep an eye on farm animals, too. She and her daughter Heidi own Rohwer’s Farm and beyond myriad heirloom potatoes, beautiful greens and golden raspberries they grow, they also raise organic lamb. One of the big windstorms this season blew the cover off her lettuce and zucchini crops, and the sheep availed themselves of the tender leaves. For all the heartache, travail and back-breaking work it is, you have to wonder why anyone farms in southern Colorado. None of the farmers I know live the high life; even the largest and most successful farms here yield a decent living rather than a windfall. But we should be grateful that they do. The effort they put into farming organically grown, pesticide-free produce (most of the farms at the market use these practices, but not all) yields the most savory spinach you’ve ever tasted, the most succulent tomatoes you’ll ever put in your mouth and the most hands-down delicious meat you’ll find, well, anywhere. So no wonder we were all out on a chilly weekend morning to welcome farmers, ranchers, bakers and others back to the farmers market, our bags and billfolds at the ready. The day warmed quickly, heading towards 60 degrees after 10 a.m. when people filled the lanes, men in khakis and T-shirts and women in gym gear, market baskets on their shoulders, children in their arms. First-time shopper Stacy Armbruster of Mancos lined up for her friend Shani Winer’s homemade organic bagels with cream cheese and fresh toppings and reveled in the happy scene. “I see the whole vibe. I think it’s awesome,” she said. Meanwhile, Winer, a new vendor, was slammed creating custom bagel orders and selling her dynamite éclairs (I should have bought more than just one) and cookies to hungry shoppers. Her Mancos bakery is called the Pie Maker, and she sells her goods during the week at the Cortez restaurant Farm Bistro. She uses mostly organic ingredients and as much local produce as she can get, as well as selling a few gluten-free treats for the wheat challenged. Right next door at the market, Kokopelli Baking Co. also is new and completely focused on serving Durango’s large gluten-free clientele. Owner Amber Davis started her business after her son Gabe was diagnosed with Asperger’s Syndrome and she used a holistic diet to help treat his symptoms. She offers gluten-free baking mixes for breads, cakes and cookies. (The chocolate chip sample was delightfully chewy and light.) She developed the mixes especially for the area’s high altitudes, which can wreak havoc on any baked good, much less ones without wheat. But the town’s well-known and well-loved bakeries were back, too, with Serious Delights putting out a huge display of cinnamon buns, muffins and sweet rolls and Bread offering its crunchy baguettes and enormous cookies. And wonder of wonders, Fired Up Pizzeria owners Tad and Vilma Brown were enjoying a day off with their two young sons, wandering the market stalls just like everyone else, while their employees turned out thin-crusted breakfast pizzas from their wood-fired market cart. “This is the first time in four years I haven’t had to work on Saturday morning,” he said with a laugh as Vilma scurried after the boys. I headed home with my goodies – piquant radishes from Rowhers, deep green spinach from Adobe Farms, gluten-free bread from Kokopelli and that tantalizing éclair from the Pie Maker – after a morning of seeing old friends and meeting new ones. Sure the Durango Farmers Market is a social scene, but when you get home, you have organically grown, pesticide free, fresh-from-the earth food that needs only a little preparation to create a scrumptious and healthy meal. How often can you say that about a morning’s outing?